In our previous post, we gave you some home maintenance tips to help avoid a water damage claim. Today, we offer some advice on protecting your home and family from the horrors of fire. There were 352,000 house fires reported in 2016, according to the National Fire Protection Association, and they resulted in more than $5.7 billion dollars in property damage. 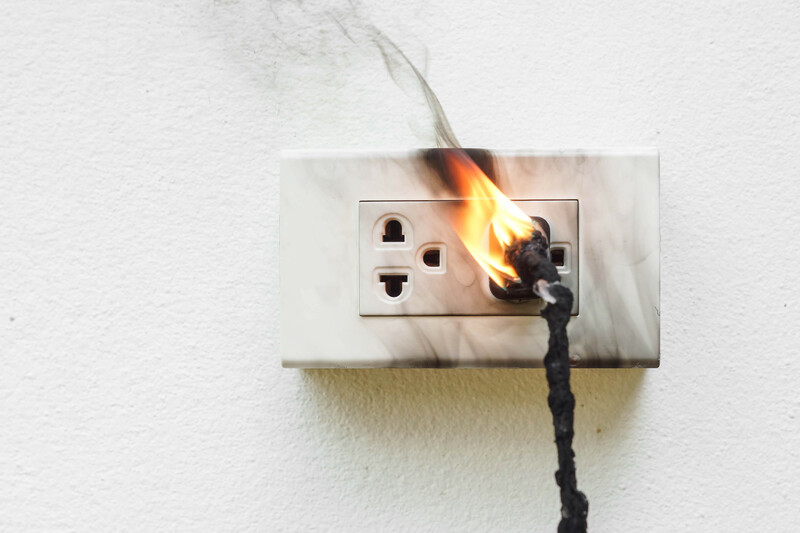 While some house fires are the result of lightning strikes, wildfires or other acts of nature, many are the result of electrical issues or human carelessness. Are you doing all you can to keep your home fire-safe? Inspect electrical cords. Any frayed or kinked cords should be replaced. Lamps and some other appliances can sometimes be rewired, but you should discard any item that appears unsafe. Make sure that cords do not become compressed under furniture or rugs. When using extension cords, make sure they are the appropriate length and follow directions for use. Don’t overload your circuits. Avoid plugging multiple items into the same outlet, or outlets that are very near one another, especially items that you use simultaneously. Older homes, in particular, may lack capacity creating added stress on the electrical system. If you are unsure about your home’s circuitry, consult a licensed electrician. Keep dryer vents lint-free. A buildup of fibers on your lint screen or in your dryer vent prevents air from circulating properly. The dryer is forced to work harder to dry your clothes, making it more likely to short out and cause a fire. Make sure to clean the lint filter every time you use your dryer, and check your dryer vent regularly for build-up. If you have a long vent, consider hiring a professional to clean it out periodically. Be safe when cooking. Never leave unattended pots and pans on the stove. Food can quickly boil over and create a hazardous situation. It’s also important to keep your range top and oven clean. Grease splatters can build up over time, and ignite unexpectedly when you turn on the heat. Secure clothing (like wide sleeves, scarves or ties) and long hair so it doesn’t come into contact with burners. And when it’s time to take that dish out of the oven? Use a hot pad, not a kitchen towel. Use caution with space heaters. About 15% of all house fires can be traced to portable heating units. If you must use one, make sure it is UL listed and follow all manufacturer safety precautions. Never place a space heater close to curtains, furniture or other objects that are highly flammable. Consider replacing an older unit with a new model that has current safety features. Have your chimney cleaned regularly. Did you know it’s possible to have a chimney fire and not even know it? Every time you use your fireplace, wood residues are deposited on the walls of your chimney. That build-up is flammable. Because a chimney is a low-oxygen environment, fires may burn out before they spread into your home. This doesn’t, however, spare you danger. Over time, the structure weakens, making a serious fire more likely. A qualified chimney sweep will clean your chimney and check for damage so you can keep the home fires burning, safely. Be careful with candles. Candles are the cause of almost 9,000 fires each year. Place them only on sturdy, level surfaces away from children and pets. Trim wicks to about ¼ inch to keep the flame small, and discard candles before they burn all the way down. Don’t leave burning candles unattended, never fall asleep while a candle burns, and when you blow the candle out, take a moment or two to make absolutely sure it’s extinguished. A hot wick can reignite after you walk away. Store flammable products appropriately. Gasoline, cleaning solvents and some chemicals, including oily rags, can spontaneously ignite in certain conditions. Read and follow all package directions, keep in original containers, and dispose of them through your community’s hazardous waste programs. Keep fire extinguishers handy. Cooking starts more than 60% of house fires, so make sure you have one in the kitchen and that it’s Class K, specifically for grease fires. It’s also recommended to have one in your laundry room, and in your garage or workshop where flammable items are stored. If you have a multi-story home, you should have at least one on each floor. A house fire is one of the most devastating things that a family can face. Though the tips above can minimize your risks, it’s still important to be prepared. One of the simplest things homeowners can do? Install smoke detectors. Though they won’t stop a fire from starting, they can buy your family precious moments to escape. At minimum, every bedroom in your home needs one. Also install one in the laundry room and another near the kitchen. Placement depends on the size of your house, and on the floor plan. For more information visit this page at www.nfpa.com. Test smoke detectors monthly, and replace batteries when needed, at least once a year. Every family should also make a fire escape plan: know how to get out of your home safely, and where to meet up once you do. If you have young children, get them involved and review it frequently so if emergency strikes, they know what to do and where to go. Contact your GSW agent for a review of your current policy or to make updates to your coverage. Click here to read the final piece in our series, Reduce the Risk of a Personal Liability Loss.